Paseo Boulevard is a north-south route through the heart of Kansas City, Missouri. The change, which was one of several options, is more than a year in the making, and Thursday afternoon's final vote split the city council 8-4. It also could take months for switch to happen, according to city officials. Councilwoman Alissia Canady voted against the change not because she disagreed with the new name, but because she believed her colleagues didn’t make the effort to get input from any of her constituents or from the majority of people who live on the boulevard. The city charter requires the support of a majority of residents who live there, and Canady is concerned the city might have opened itself up to legal action. “And had they given that or worked to get the support of those individuals, I would vote for it," she said. But Councilman Quinton Lucas, one of the sponsors of the resolution, said Kansas City was long overdue to honor the civil rights icon. The vote came on the same week of the national holiday for King, who was assassinated in 1968. He also said he was surprised how personal the discussion got among the councilmembers. Chris Hernandez, city communications director, said getting new, basic street signs can be handled internally in about three months. Bigger signs that are illuminated are a special order that can take up to six months. “But that’s not the only thing we need to work on. We need to coordinate with the U.S. Postal Service on their timeline so we can insure correct mail delivery,” Hernandez said. Staff will inform residents and businesses of the timeline. Sharon Sanders Brooks, former third district council member, was there for vote. She was happy with the result but not happy with how long it has taken. Rev. Vernon Howard, pictured in the bowtie, with the Southern Christian Leadership Council was one of the leaders in the movement to change the name of the Paseo to honor Martin Luther King Jr. The effort started back in 2011, when councilman Jermaine Reed tried to rename Prospect Boulevard after King. And in 2016, a group of black clergy members proposed the Paseo name change, but the parks department declined their request. A mayor-appointed task force studied the issue and recommended renaming Paseo as the third choice. 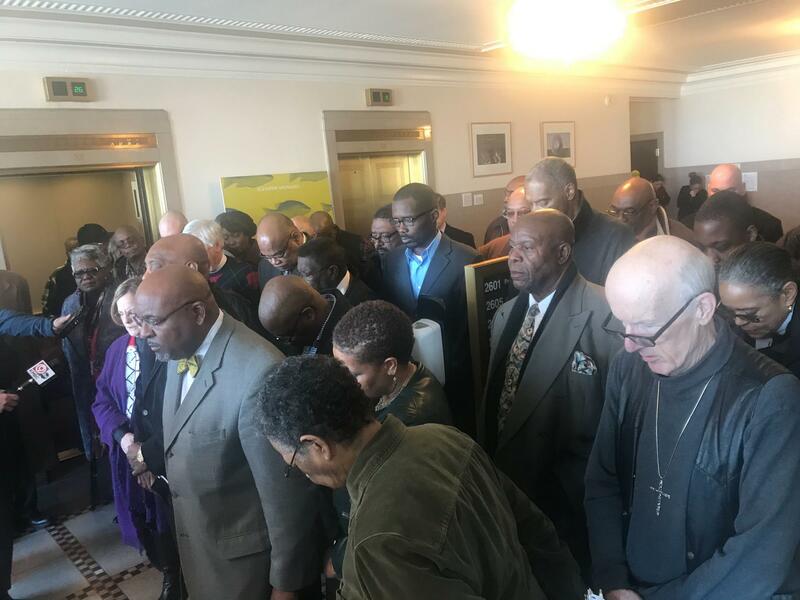 As recently as this week, several local organizations reached out to city councilmembers to reiterate their support for renaming Paseo to honor King, including the Southern Christian Leadership Conference of Greater Kansas City and the Jewish Community Relations Bureau. The Rev. Carmen Williams is among the coalition of ministers who backed the change. She was disappointed in the councilmembers who voted against it especially her representative, Canady. The Paseo is the first of Kansas City's historic boulevards, which all stemmed from the 1893 report from German landscape artist George Kessler. It's named for Paseo De La Reforma, another grand boulevard but in Mexico City. A city council committee unanimously passed a measure to rename Paseo Boulevard after Martin Luther King, Jr.
At Wednesday's meeting of the planning, zoning and economic development committee, most of the eight people who spoke supported the name change.